Behind junior Asia Durr’s 22 points, No. 3 women’s basketball holds on to a 66-60 win over No. 17 Duke. Now 17-0, Louisville continues their best ever start to a season. Their 17 straight wins is also a program-best. Louisville shot 25 percent from the field in the second half, but didn’t allow Duke to score in the final three minutes of the game. Duke shot 71 percent in the first half and outscored U of L 18-10 in the fourth quarter. Coach Jeff Walz said his team didn’t do what they needed to do defensively. “That was an ugly, ugly ball game defensively for us. We did not do a very good game of following the scouting report,” Walz said. 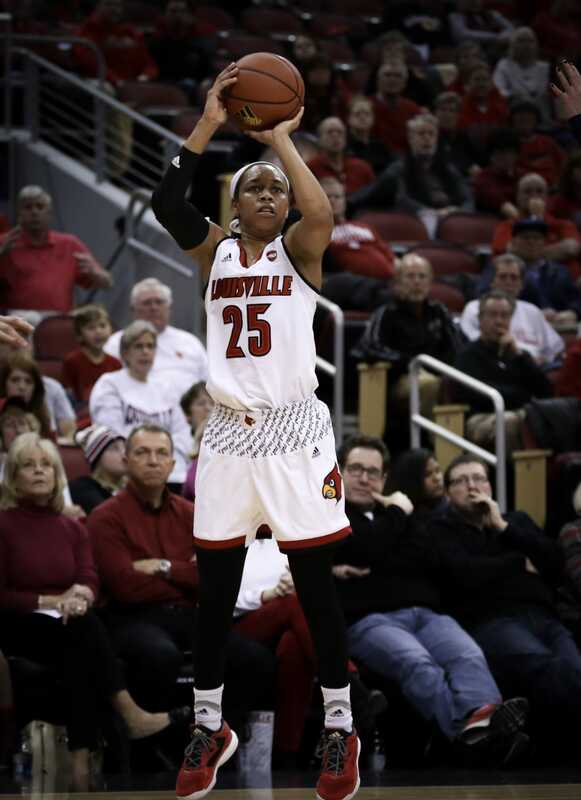 The Cardinals out-rebounded the Blue Devils 35-29 and their 16 offensive rebounds led to 12 second chance points. Duke committed 15 turnovers, leading to 21 Louisville points. Senior Myisha Hines-Allen recorded another double-double with 13 points and 10 rebounds. Louisville started the game shooting 7-of-7 while the Blue Devils started 5-of-5. The teams continued their hot shooting through the quarter, but turnovers were the difference. Duke committed six turnovers before Louisville committed their second. This difference, atop of Durr’s four 3-pointers, led Louisville to a 10-point lead at the end of the first quarter. Duke shot 8-of-10, but their seven turnovers prevented them from getting a lead. Louisville had a 14-2 advantage in points off turnovers. Two minutes into the second quarter, Durr went down on defense and needed to be carried off the court. Without Durr, who was perfect from the floor, Louisville went 4-of-5 from the field. Arica Carter carried the offense, getting a pair of assists. The Blue Devils shot 7-for-11 from the field in the quarter, but couldn’t string together defensive stops. They trailed 43-33 at the break. In the first half, Louisville shot 17-of-30 (56.7 percent) and Duke shot 15-of-21 (71.4 percent). In the third quarter, neither team shot higher than 30 percent. The Cards forced five more turnovers, but were 0-for-6 from deep. Louisville couldn’t pull away, only out-scoring Duke 13-9 in the quarter. Duke trailed by 12 entering the final quarter, but Haley Gorecki (25 points) led the comeback. An 8-0 run by the Blue Devils made the Louisville lead 59-53. Hines-Allen ended Louisville’s six-minute field goal drought, but Gorecki came down and hit a three to answer. Up 63-60, and on the wrong side of a 15-4 run, Louisville didn’t allow Duke to score in the final three minutes.